Socca – How can something so ridiculously simple taste so outrageously good?! In Spain we can easily buy chick pea flour as it’s used to make Tortillitas de Camarones, little deep fried “pancakes” made with the tiniest prawns imaginable. They are so very, very good. My previous experience of cooking with chick pea flour (or gram flour, garbanzo flour or besan) was in Indian cookery to make bhajis. In my search for other uses, I kept coming across recipes for Socca, a chickpea flour pancake, usually cooked at high heat in the oven in a small cake tin or tray. I also found a version in my wonderful River Cottage Bread Handbook which was cooked in a frying pan. Perfect for summer when you want food you can cook quickly without using the oven. We ate this with Chargrilled Aubergines in Tomato Sauce – tearing up pieces of the pancake and dipping. Fantastic if you enjoy sharing dishes and are not too proud to slurp and lick your fingers! Pour the mix in, it should be thick in the pan and cook until it starts to char on the edges. Flip it over and cook the other side. Serve immediately and imagine you are eating it sitting in a bustling bar in the South of France sipping an ice cold beer and watching the world go by from under the brim of your slightly battered panama hat…. On Thursday morning we’ll be heading off down the mountain and driving north across Spain. Hopefully we’ll get our heads down for the night near Bordeaux and onwards Friday morning towards Calais and an early evening crossing to Dover. Then we go west to our little home in Bexhill. Just for a few weeks you understand, we have a Golden Wedding Anniversary to celebrate with my parents and walks along the beach with the pups. We will enjoy the last of the beautiful English summer before we head back to our mountain home for the September fiestas. I’ll still be checking in here, but perhaps not as often as usual. See you when we get there! Well, what a weekend of e-mails many of us have had. Thanks a bunch WordPress (not!) for inundating us all. It´s been quiet on the blog front as many of us have held off from posting or commenting for fear of drowning in a sea of unwanted e-mails. Hopefully we are all daring to put our toes back in the water…but please don´t forget to remove that tick from the box below the comments one so that you don´t receive all those messages if you´re brave enough to leave messages again! It´s been a strange weekend here too weather wise up the mountain. Saturday was like the depths of winter, Sunday got better and this week it looks as though summer is on its way with temperatures predicted in the high twenties. Feeling grey and damp on Saturday, we indulged in a big bowl of comforting Olla (pronounced Oya) or Puchero. The word Olla in Spanish is a big cooking pot. Often this dish is named after the pot it is cooked in. 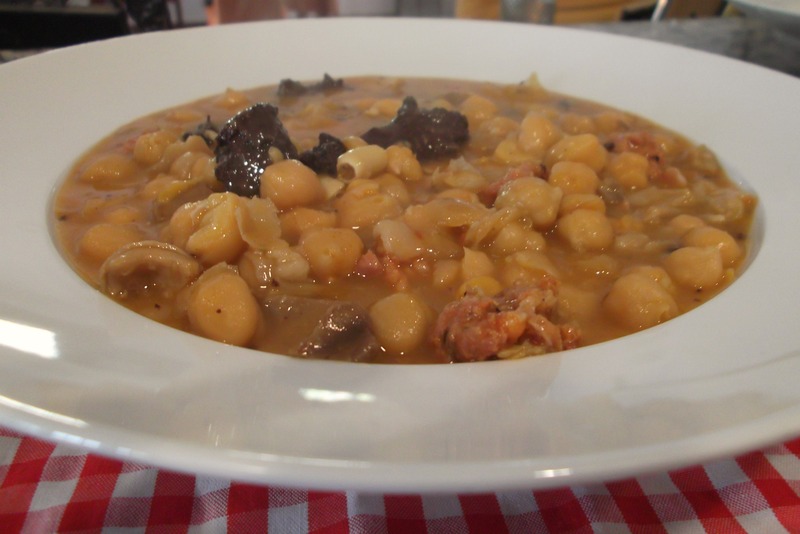 It´s a hearty, filling winter warmer that if eaten for lunch (it´s never eaten for dinner here, probably because of the “natural effects” of chick peas) will keep you going all day . This version lists the ingredients typically used locally, but also gives options for making it outside of Spain where not all of the ingredients will be so easily available. The salted bones and fat add flavour and give the broth a cloudy or white appearance, which is the sign of a good stock in Andalucía. Clear stock, I think I´ve mentioned it previously when talking about Chicken Soup, is considered to be lacking in flavour! If you use the salted bones, you won´t need to add much in the way of seasoning at the end. If not, add salt after the chick peas have cooked, otherwise they will never soften. Put all the ingredients into a large stock pot, pushing the meat and bones down to the bottom. Add water to cover everything well and bring to the boil. Skim off any froth that rises to the surface during the first 10 minutes of hard boiling then reduce the heat to a very low simmer, cover and either simmer gently for about an hour and a half until the chick peas are completely tender or cook in a very low oven for 3 to 4 hours. Remove the bay leaves, chilli, pork skin and bones, shred the meat and chop the carrots and celery if you prefer, season if necessary and serve in deep bowls with plenty of the delicious stock poured over. Variation. Some people also add pig´s trotters to this dish, so if you enjoy them, do feel free to add. This weekend I omitted the pork fat and added celery and carrots to make it a lighter but still filling dish. My stock is probably not up to Spanish Housewife standards this time as it´s on the verge of being clear! This is a dish which will improve and develop flavour if prepared a day ahead. Ok, I know this is going to sound quite off putting for many people. Tripe is a scary old thing. But fear not, although the word “Callos” translates as tripe, I don´t actually put any into this dish (although you could). Confused eh? Well, let me explain. The first time I ever ate this dish was at a Feria in a nearby hamlet. It´s tiny, probably only a dozen houses, but it belongs to our “Municipio” and puts on an amazing fiesta every year. One of the first of the summer in fact. They always seem to attract a good flamenco singer, they do a fantastic paella at lunchtime, and they always have plenty of good food apart from the usual pinchitos (kebabs) and montaditos (fillets of pork on bread). Hundreds of people attend, it´s a great event apart from the winds which whip down the mountain and make hairstyles, skirts, old people and small children blow all over the place. So, Big Man ordered me a portion of Callos which was essentially a chick pea stew with tiny chunks of meat, chorizo and morcilla in it. I loved it and looked up the word when I got home and though “oh lord, I´ve been eating tripe”! During the almost six years I´ve lived here, I´ve only eaten it a couple of times a year as not many people make it anymore – it´s not complicated to make, but it takes time. Of course, I recently decided that I wasn´t prepared to wait until next summer for my fix, I´d make my own. This is where the fun started. I asked the butcher to prepare me whatever I needed for this dish (meat wise) and that´s when I found out that her version would not include tripe. See – not so scary after all (well, maybe apart from the blood)! I also had to buy some chorizo and morcilla and chick peas. I´m not giving measurements here as it´s a kind of “make it up as you go along” dish. I then asked about 20 different people how they made Callos. Half had never made it so were of no help at al. The others gave me 10 different ways of making it, each with their own little “twist”. This is what I eventually came up with, and I have to say it tasted as good as the Fiesta version, and Big Man thought it was better…modesty prevented me from saying that myself of course! Soak the chick peas overnight and the next day cook slowly for a couple of hours with a few bay leaves, 4 cloves, and a dried chilli until completely tender. Don´t rush this, you´ll have plenty to be getting on with while they cook. In a separate pot blanch the all the pork products, drain and put into fresh water. Now cook slowly for a couple of hours until really tender and drain again. Get those kitchen gloves on and pull all the tender meat off the trotters and discard the bones (or give them to your dog who will love you forever). Now add the chunks of meat to the cooked chick peas (still in their water). Add about 5 or 6 whole cloves of raw or roasted garlic, some saffron dissolved in water, ½ a teaspoon of sweet or hot pimentón, the whole chorizo and morcilla (which you will slice before serving) and cook for about 30 minutes. Leave to stand for at least 15 minutes before serving (but it´s even better prepared the day before) and remove the cloves, bay leaves and dried chilli. Make sure you have a table full of very hungry people, don´t tell them what´s in it if they´re a bit squeamish, and enjoy. Now go for a lie down…you´ll need it!